Whether it’s supporting the welfare of children or responding to the plight of homeless pets, Michela Belluso is driven by a passion to help the most vulnerable. 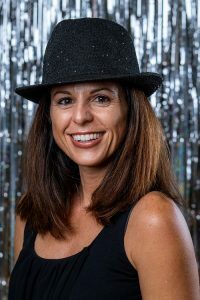 As owner and managing partner of Phoenix-based, full-service marketing and advertising agency Davidson Belluso (D/B), that passion has led her to serving the community in a variety of ways. Since founding D/B in 2001 with husband Rob Davidson, Michela has led her marketing team in developing community outreach campaigns for nonprofit organizations such as Childhelp, Lifewell Behavioral Wellness, New Pathways for Youth (formerly Youth at Risk), Phoenix Children Hospital and Phoenix Rescue Mission. Michela has served on the board of directors for The Arizona Pet Project (formerly Friends of Animal Care & Control) and on the marketing committee for The Leukemia & Lymphoma Society. She also donates her agency’s services to Team Asa and their annual Polar Bear Plunge at The Lakes event whose proceeds support recreational and social opportunities for children with disabilities. With a lifelong love for dancing, Michela started taking ballroom lessons in the fall of last year, something she had always been drawn to but never had a chance to try until a ballroom studio opened up right next door to her gym. Learning to dance the full gamut of smooth and rhythm styles has become somewhat of an addiction for Michela. The Tango, Viennese Waltz, Rumba, Cha-cha and Salsa are amongst her favorites, not necessarily in that order. After attending the 2017 Dancing for Arizona’s Children event to support a friend, Michela was so inspired by their mission and impact in the community that she decided to take on this new challenge. Support Michela Belluso by purchasing your sponsorship, People’s Choice Votes and/or tickets below to attend our brunch event on December 1, 2018. If you aren’t able to attend, you can still support her by purchasing votes for her to win the People’s Choice Award!